Considering the mobile constraints related to resources such as videos, Exoplayer is an excellent choice for handling videos in your Android application. ExoPlayer offers video buffering, in which the video is downloaded ahead of time so as to give the user a seamless experience. With ExoPlayer, we can play videos either from our phone storage or from direct URLs, as we will see later on. In this ExoPlayer android tutorial article, we will show how ExoPlayer provide a display solution in combination with Cloudinary, which supports video management and transformation. Cloudinary helps us manage our video resources in the cloud with a high-performance cloud-based storage. With Cloudinary, we can comfortably upload videos and transform them by just tweaking URLs. Your videos are then delivered through fast Content Delivery Networks(CDNs) with advanced caching techniques. Let's take a look at how we can upload and manipulate videos with Cloudinary. You should replace CLOUDINARY_NAME with the Cloudinary name found on your console. We then create an application class to initialize Cloudinary once throughout the app’s lifecycle. Since the AppController class is just initialized once, global variables are usually stored here. Cloudinary offers unsigned and signed uploads. Signed uploads come with some added advantages, which require an API key. However, using an API key in an Android client is not recommended since it can easily be decompiled. For this reason, we will make use of the unsigned upload for this exoplayer android tutorial. We first have to enable unsigned uploads in our console. Select settings on your dashboard, select the upload tab, scroll down to where you have upload preset, and enable unsigned uploading. A new preset will be generated with a random string as its name. YOUR_PRESET should be replaced with the string that was generated after enabling unsigned upload. Cloudinary offers many more transformations for our videos that you can learn about here. If your gradle version is below 3.0, you should use the compile keyword instead of implementation to add dependencies. // Produces Extractor instances for parsing the media data. We initialized the SimpleExoPlayer instance with some default configurations. We created and initialized an instance of SimpleExoPlayerView. We then assigned our existing player instance to it. We generated our media source using a videoUri parsed from a video URL from Cloudinary. We then prepare the player with our video source and our video is ready to be displayed. This gives us a basic implementation of ExoPlayer. We created the SimpleExoPlayer instance as a class variable to make it accessible to all methods in the class. This is how our app should look like if we play the transformed URL with ExoPlayer. 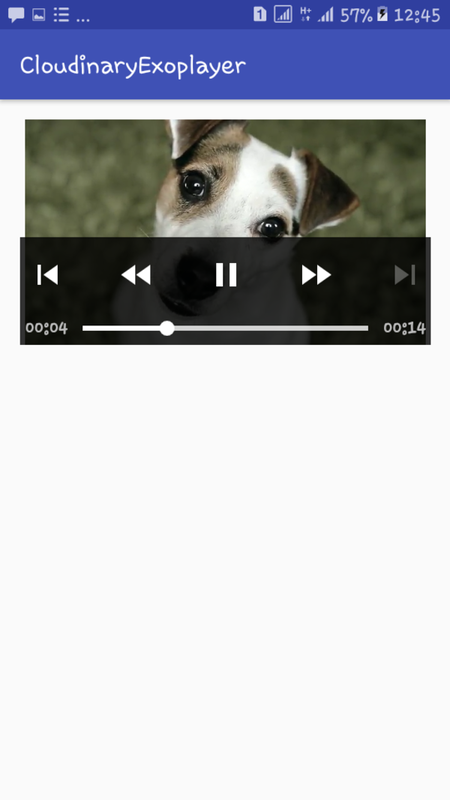 Cloudinary provides us with an excellent video management solution and integrating it with libraries, such as ExoPlayer, to display videos on our Android app is very easy. In this exoplayer android tutorial, we have shown how we can upload and transform videos, then display them. Cloudinary offers many more features and functionalities, which you can checkout here in the docs.